I have always been very fascinated by the fact that Rice Pudding per se exists all over the world. What makes it even more fascinating to me is how its ingredients and preparation vary from country to country. What remains constant in this recipe is the rice and milk, however, depending from country to country, or even from region to region, the rest of the ingredients are different. Back in the days when I used to work at a local university every so often my boss and I shared a bowl of Arroz con Leche from the campus food court. I loved adding raisins and walnuts on top as they added some extra sweetness and crunch. 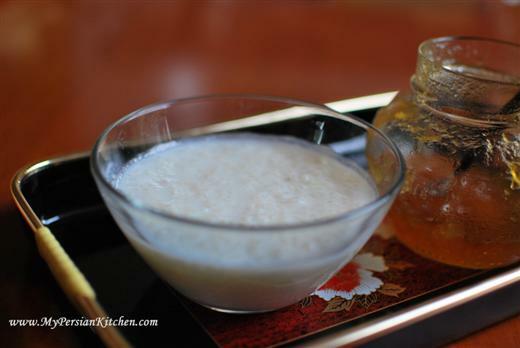 The Persian version of Rice Pudding is very simplistic, yet huge on flavor. In fact Sheer Berenj on its own is simply made with rice, water, milk and rosewater. Since no sugar is added, Iranians either add jam or honey when it is served. This is a super easy recipe and it’s a great dessert option. 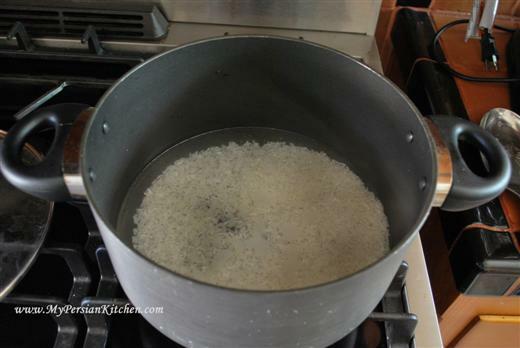 Wash rice and cook with 2 cups of water and a pinch of salt for about 20 minutes. 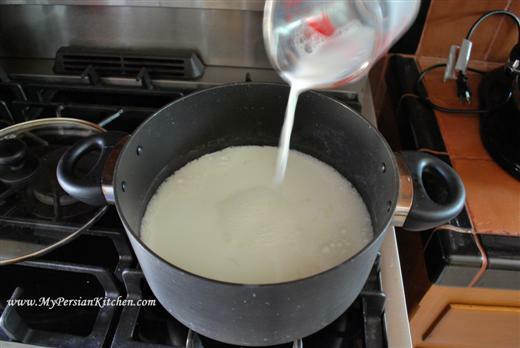 Add 4 cups of milk and cook on low for 1 hour. Occasionally, stir the pot to make sure that the bottom does not stick. 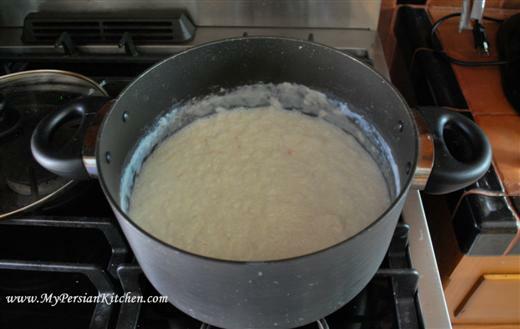 After one hour the rice and milk will thicken into a pudding consistency. Add rosewater and let cook for a few more minutes. Place in a large bowl, or several small bowls, let cool to room temperature then refrigerate. Some people like to use cardamom in Sheer Berenj along with rosewater. You may add 1/4 tsp along with rosewater in the end. For a creamier consistency, you may use 2 cups of milk and 2 cups of cream or half and half. Serve with your favorite jam, honey, or sugar. Ahhhh, such happy memories of this beautiful dish. I remember my mom making it for me in Iran with whole milk and a decorative dusting of cinnamon on top. To this day, I think this is why I prefer rice pudding that’s not too terribly sweet. The new site design is looking good, by the way! insane. Anything with rose water and honey on top… I Can’t wait to try this one out. First I need it to warm up for my roses to bloom so I can make some rosewater. This is delicious. So comforting and homey. The rose water must perfume the entire dish. I like the option of adding your sugar in yourself, you can taste the rice and milk rather than tons of sugar. In Pakistan, we have something similar called kheer. It has cardamom, slivered almond, pistachios. and sometimes silver leaf. I like your blog a lot. I even tried some of your recipes, with small changes as it suited my personality better. I would like to ask you if you are interested to reciprocally place links on each other’s blog. All the best and have a lovely weekend ahead. One of the best food blogs I’ve ever encountered! but I am going to tell you the truth. The new font, little Persian looking logos and the colour beige, all horrible. I feel the end of that lower “p” has stabbed me in the stomach. I tried the recipe and found that the cook times were too long for the amount of liquid – I had to add extra. Or maybe use a smaller element. But it turned out great, and is yummiest with jam! @ Hila, Thank you for your kind words! @ Kelly, I am sorry it all didn’t work out for you. Did you cook it on low? Yeah, I cooked it on low, but I used a medium element, and maybe that’s what the problem was. I’ll try the smallest element next time. thanks for putting the rice pudding recipe !! I adore this rice pudding!!! I used half & half and 2 % milk and it was nice and creamy but not too heavy. I did not add the optional ground cardamom and it was just perfect anyway (my favorite spice in sweets is cardamom..) I used Iranian rose water (which is most superior) and was afraid it would be too much but it wasn’t… Served it warm with slightly warmed local, organic, raw honey!!! I will make this again for sure. Hi….love the blog, maybe the logo isn’t the sexiest, but it is still a much needed wonderful addition to my every day cooking. I am not Persian, but granddad was Syrian, so I love the cooking ….I watch Shahs of Sunset and felt compelled to make tadiq last night. It was wonderful. Can you suggest a proper dutch oven. Should I buy one that is teflon. Will that help with the rice sticking. Persian cooking is the bomb!!!! So many wonderful stories & recipes! And to the rude person who criticized your design they should be as talented & creative as you!